← Two Amateur Tournaments on Monday, both open to All Amateurs!! Select one, and ENJOY!! Clermont Recreation Club Open House. The Clermont Recreation Club had a very successful Open House as a farewell to the Historic Kehlor Building recently. 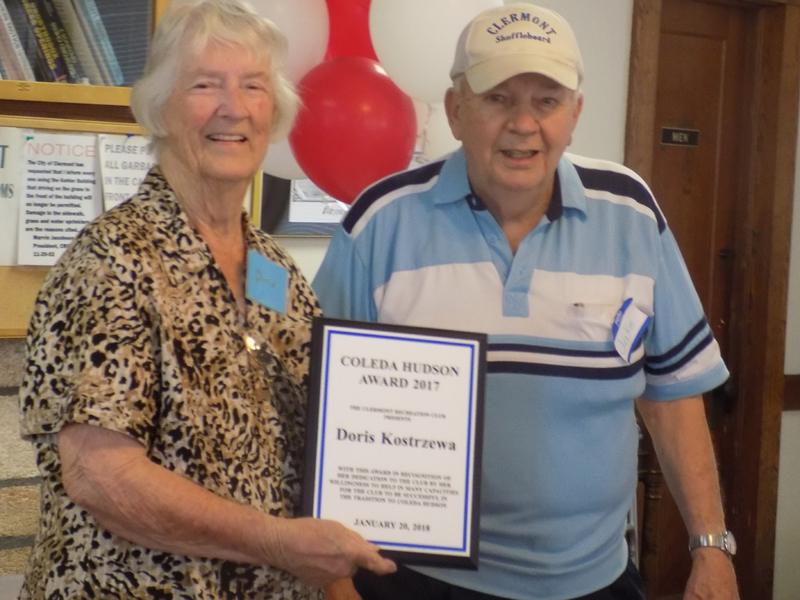 The club presented the Coleda Hudson award for 2017 to Doris Kostrzewa in recognition of her dedication to the club in the tradition of Coleda Hudson. The club offers many activities for anyone living in the area. Chess, duplicate bridge, party bridge, scrabble, dominoes, bunco, pinochle, samba and a philosophy discussion group. All activities take place at the Historic Kehlor Building 466 W. Minneola Ave.
Go to https://clermontrecreationclub.com For more info call Peggy at 352-480-4508 or Jean at 352-242-9756. The club has great shuffleboard courts and welcomes new players to come check the game out. The club has open shuffling every Tuesday and Friday at 1: 00 p.m. and at 7:00 p.m. on Tuesday and 9:00 on Saturday. All equipment needed to play is provided. During the month of February will be having a brief introduction to shuffleboard from 11:00 a.m. to noon on Saturdays for new players, with a pizza lunch provided. Just come to Kehlor Park at 466 W. Minneola Ave. For info call Jake at 352-242-9756.